Having babies sleep on their backs has successfully reduced the rate of SIDS, but has also been accompanied by reports of an increase in the number of babies diagnosed with flattening of the back of the head. Is this increase real? Or are people just paying more attention to head shape? And does it go away on its own? Researchers at the University of Auckland Brigham Young University developed a new method for measuring head shape. They use an elastic head circumference band that they photograph digitally from above the head. A custom-written computer program analyzes the photo to quantify the head shape. Using this technique, they followed 200 children for 2 years to see how their heads changed over time. The results appear in the October 2004 Pediatrics. About 30 percent of the babies had head shape abnormalities at some point during the first two years. 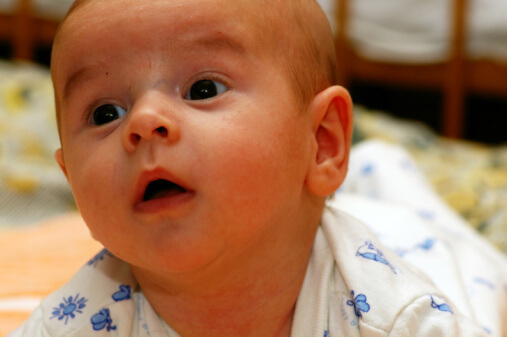 The most common time to see head flattening was age 4 months. No new cases began after 8 months of age. Overall, about 90 percent of the head shape problems disappeared on their own by age 2. The more hours that babies spent flat on their backs, the more likely they were to have head flattening. Even 5 minutes a day of tummy time had a protective effect. The back is great for sleeping, but other positions are wonderful for when babies are awake. I prefer at least 30 minutes total of tummy time each day once the cord has fallen off.